Dogs never cease to amaze us, whether they’re communicating or teaching themselves new tricks. Therapy dogs go a step even further, as they can help improve a host of mental and physical ailments. Here is a closer look at what therapy dogs do, the science behind their efficacy, and the steps you can take to get your pup certified. For starters, a therapy dog is not the same thing as a service dog (it’s also not a dog with a prescription pad and PhD). A service dog is trained to provide assistance to someone with a specific disability such as blindness, epilepsy, or PTSD. This is essentially a full-time job for that dog, as his owner is usually the person for whom he provides this particular service. A therapy dog needs training as well, but it tends to be more generalized and temperament-centric than, say, the very specific way a service dog is trained to protect his owner’s head during a seizure. Therapy dogs visit hospitals, assisted living facilities, college campuses, and even prisons, and provide love, comfort, and companionship. You know when you’ve had a bad day at work so you walk by the pet store on your way home and spend 30 minutes watching puppies playing in the window? It’s a lot like that, on a more institutional level. What is the science behind therapy dogs? High blood pressure (or hypertension) is a major risk for heart disease and stroke, so reduced blood pressure is tremendously important. Patients in assisted living facilities or hospitals may see lower blood pressure levels after spending extended periods of time petting a dog. Endorphins are essentially a naturally occurring form of morphine, inducing a little jolt of euphoria when activated (think: the high you feel after going on a long run). Oxytocin is also a very powerful hormone – often called “the love hormone” – and gets triggered when you hug or kiss a loved one (or see a friendly tail wagging your way). It’s also believed to be the chemical backbone that underlies the feeling of trust. Cortisol is a steroid hormone released in response to stress, and it mostly works to increase blood sugar and assist in the metabolism of fat, carbohydrates, and protein. Things like massage therapy and laughter lower cortisol levels, while caffeine, sleep deprivation, and severe trauma increase them. Which category would you rather fall into? Of course, not every dog has the temperament to be a therapy dog. My own dog, for example, has such an intense fear of strangers that most interactions lead to skyrocketing blood pressures for all parties involved. This, among other reasons, is why he won’t be signing up for therapy duty anytime soon. Think your dog has what it takes? How can my pup become a therapy dog? If you’re thinking about turning your dog into a charitable super hero, he’ll need to exhibit a few prerequisites. Is your dog naturally calm and friendly around strangers? Do crowds, loud noises, and sudden movements give him anxiety? Has he received (and excelled in) at least basic obedience training? If the answer to all of the above is yes, then congratulations! 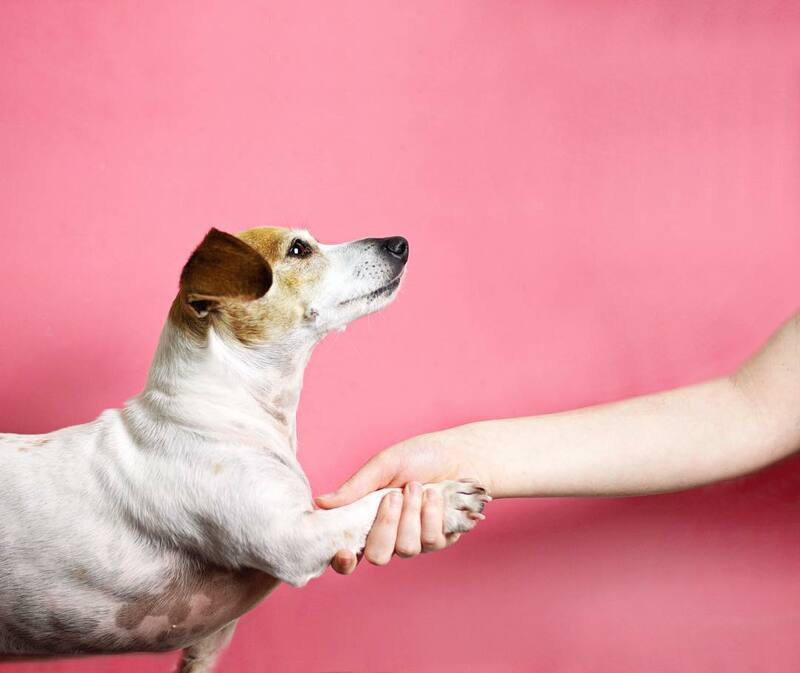 You’re on your way to becoming a dynamic therapy duo (you, as the handler, are an important part of this equation too). To become a licensed therapy dog, you and your pup will need to pass a test and get certified by an official registry. Though the specifics of the test will vary between registries, most tests gauge your dog’s ability to sit, stay, walk through a crowd, and respond to other commands. Once you’re registered and ready to go, you can ask your registry for a list or simply reach out to hospitals, nursing homes, or any other group you feel could benefit from quality time with your newly anointed therapy dog. The world is your oyster; some therapy dogs even visit children’s libraries and sit with kids who are learning to read. Your dog’s patient, nonjudgmental gaze can help a child develop the confidence he or she will need to continue improving those reading skills. You might not be able to heal the world, but your dog’s love and companionship can help brighten it. And if nothing else, it will give him a reason to work for those treats. Jeff Tracy is a freelance writer living in Brooklyn, NY. He loves playing darts, eating pasta, wearing flyknit, and watching his dog fall asleep in funny positions.